the following year, and once again Deep Blue won. 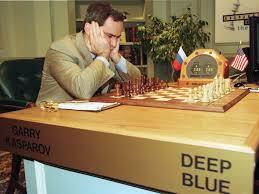 Deep Blue’s victory has been attributed to the supercomputer’s ability to identify and evaluate a huge number of alternative and sequential moves from both players, and predict the final board position that would result from those moves. If you’re a player you’ll know this: chess involves 2 players, each with 16 pieces or chessmen which can be moved in a variety of ways on an 8 x 8 square board. In 1950, applied mathematician Claude Shannon calculated that the total number of possible variations in a typical chess game of 40 moves per player is 10120 (that’s ten followed by 120 zeroes) which presented an insurmountable challenge to the machines of that era. Twenty years later, in 2016, AI was applied to the Chinese game of Go. 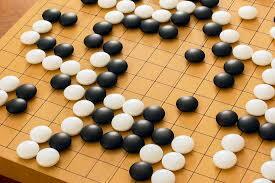 Go is played with polished stones on a 19 x 19 square board. DeepMind, an organisation owned by Google, developed an AI engine dubbed AlphaGo that competed against and beat the world’s best Go players. Google’s programmers trained AlphaGo in about 30 million Go moves kindly provided by expert players. These moves served as a foundation for the machine to play itself and learn through reinforcement. Rather than the brute processing power that delivered Deep Blue’s chess victory, AlphaGo’s victory was founded on Machine Learning. Over time, the machine learned which moves and patterns of moves would bring the best reward in any given board context. The machine does not just use the original data provided by programmers, but develops new data from the games it plays, improving game outcomes over time. AI enabled the machine to learn, to step beyond the moves provided by the experts, and develop new moves that eventually lead to victory. These two examples show how AI has been deployed in games that operate within a fixed set of parameters – number of players, number of playing pieces, range of permitted movements of the pieces, turn-taking and a clear and shared objective. Human intelligence, on the other hand, often operates in a parameter-free or volatile environment, and therefore presents a significant challenge to AI engineers. AI’s already here, but you may not know it. AlphaGo may have grabbed the headlines, but you may already be feeling the impact of AI in your everyday life. Maybe you are using Apple’s digital assistant, Siri. Siri is integrated into the operating systems of iPhone4 and later, as well as some iPad and IPod models. Users can ask Siri questions, instruct Siri to make calls, send texts, shoot pictures, set alarms, search the Internet, read messages, open apps, play music, tell a story and much more. Siri’s speech recognition engine uses Machine Learning to improve contextualized performance over time. When you perform a Google search, Google serves contextualized ads to you that take account of your search history and location. When you buy on eBay, it’s the same – ads related to your search behavior are fed to your device. AI enables businesses to deliver contextually appropriate customized messages to consumers. That’s pretty much routine these days for many businesses, but AI is going to be a critical and central part of CRM in the future, for a number of reasons that we’ll explore in upcoming blogs. Watch out! Major CRM brands such as Salesforce, Microsoft, SAS and Oracle are investing billions in AI R&D. Tagged: AI, Artificial intelligence, CRM, marketing.